Signed lower right, Walter Clark. Oil on board. 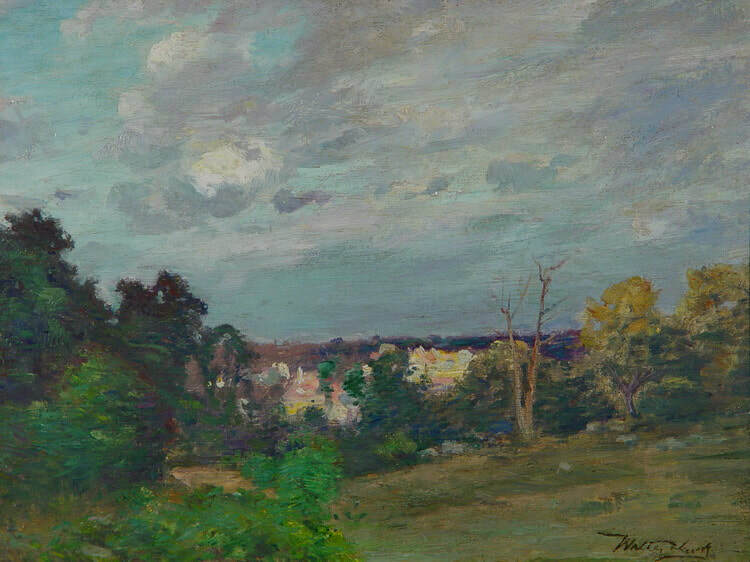 12" x 16"
​​​​​​Noted tonalist Walter Clark was educated as an engineer at the Massachusetts Institute of Technology before pursuing an artistic career. After completion of his class work at MIT in 1869, he traveled extensively in Europe studying art and architecture. Returning to New York, Clark entered the National Academy of Design in 1876, where he took instruction. In 1881, he came under the tutelage of George Inness at the Art Students League. Inness would have a profound influence on Clark, and the two artists occupied adjacent studios in the Holbein Building for many years. Best known for his subdued, pastoral landscapes of Long Island, Chadds Ford, Old Lyme and other East Coast destinations, Clark enjoyed a successful career and distinguished reputation. He exhibited at the National Academy for nearly four decades, earning the Inness Gold Medal in 1902. He was featured in other important exhibitions as well, including shows at the Pennsylvania Academy of the Fine Arts, Art Institute of Chicago, Boston Art Club. Brooklyn Art Association, and the 1893 Chicago and 1904 St Louis World Fairs. Clark was a member of the most prestigious art associations of the day. Encouraged by his friends John Twachtman, Edward Potthast, and Joseph DeCamp, Clark began working in an impressionist vein in the 1890s. He spent summers painting in the art colonies at Cos Cob and Old Lyme, CT;Gloucester, Massachusetts; and Ogunquit, Maine. Clark's works are included in the collections of the Bush-Holley Museum in Greenwich, CT, and the Wright Museum of Art in Wisconsin.